President Trump has refused to divest himself of businesses and investments that could pose conflicts of interest. For example, the Trump International Hotel (seen here), located just blocks from the White House, regularly hosts events with foreign diplomats, interest groups and industry associations. Trump, unlike other presidents in recent decades, has refused to make his returns public. He also has refused to divest himself of businesses and investments that could pose domestic or international conflicts of interest. 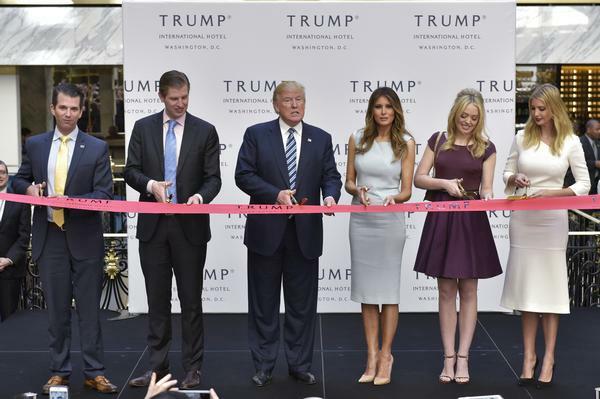 For example, the Trump International Hotel, located just blocks from the White House, regularly hosts events with foreign diplomats, interest groups and industry associations. By law, taxpayer information is supposed to remain confidential. But as University of Virginia law professor George Yin, author of a 2017 article on the law, told NPR, Congress didn't like being dependent on the executive branch to provide tax records. When the "committee access" provision, as it's known, became law in 1924, Congress had been dealing with taxpayers' information in the Teapot Dome scandal afflicting the Harding administration and in a controversy involving former Treasury Secretary Andrew Mellon. Like Trump, he had served in government while refusing to avoid conflicts of interest by letting go of his holdings. For the party in control of the House or Senate, making the request is easy. It would come from the chair of the House Ways and Means Committee (the House panel that writes tax law), Senate Finance Committee or Joint Committee on Taxation. Democrats have been badgering the Republican chairs of those panels to act since February 2017 without success. Once a request is made, no floor action is necessary. The request would go to Treasury Secretary Steve Mnuchin, who oversees the IRS — not to the taxpayer in the Oval Office, who would officially be out of the loop. Yin said the 1924 law "gave the tax committees the unqualified right to request the tax returns of any taxpayer." What would happen next is uncharted territory. Based on recent events, Trump might deploy Justice Department lawyers, and perhaps private lawyers, to fight the request in court. The process might resemble the not-infrequent legal battles over congressional subpoenas for executive branch documents. But the committee access provision has never been before a federal judge. Were Congress to get access to Trump's returns, it would be easy for lawmakers to disclose the information, despite various privacy protections that exist for taxpayers. The chair or committee with Trump's tax returns could submit them to the full House or Senate if there's a legitimate legislative purpose. At that point, the returns would very likely quickly become available for the public to see on the Internet.